Despite what you think of the Nittany Lion’s performance on the field as of late, there’s no denying that Beaver Stadium is one of the best football stadiums- scratch that – one of the best venues in the world, to experience as a sports fan. Like many Penn Staters, both my husband and I are part of multi-generational PSU lineages (We truly “bleed blue and white.”); we’ve both been attending games at Beaver Stadium since we were little, and perhaps have taken for granted how special it is to be one of the 106,572 faithful fans that get to cheer on (and sometimes curse!) the Nittany Lions on a regular basis. Inspired by last year’s stripe out game against Rutgers and the lack of fashion sense displayed by many PSU co-eds, I wrote this article, hoping to encourage young women to put a little more effort into their homecoming game attire. Even when our team isn’t playing their best, the electrifying atmosphere within Beaver Stadium (especially during night games!) puts our fans in the national spotlight. Because of this, it’s disheartening to see many in the student section dressed so shabbily, and frankly, so skanky. I had so much fun putting together that piece last year, I decided to update it again for the rest of this year’s football season. To see why Penn State holds such a special place in our hearts, I invite you to read that post in its entirety. Then check out my newest suggestions for stylish game day outfits below. For even more Penn State fashion, head on over to my Pinterest page. Start with a great fitting pair of jeans and staples in blue and white and your game day outfits are endless! 1. Lion’s Pride on College Avenue in State College is my favorite Penn State apparel and accessories store. Their merchandise is a little more high-end than other local retailers, with products others don’t carry. Like this classic crewneck sweatshirt. It’s slightly fittled for a more modern take on the bulky hoodie. 2. A classic Breton-style striped tee is a wardrobe staple and a must for every PSU fan. This soft knit tee from 1791 Supply and Co. gives you the t-shirt look but with slightly longer sleeve lengths just right for the Autumn season. All of 1791’s goods are made in America and are truly classics – you’ll wear these pieces season after season for years to come! 3. A chambray pullover is the perfect layering piece, especially for warmer fall afternoons or those early 12PM kickoffs. 4. Jean shopping is seriously the worst, especially with some of the current denim trends. Co-eds, I’m begging you, hang up the high-waisted acid washed Mom jeans (Why do you want to look like you’re 30 years older than you really are, anyway?) Personally, I think the most all-around flattering, goes with sneakers, flats, pumps, or boots are a straight-leg cut in a medium wash. JCrew’s Matchstick Jeans are a good option. They are made with cotton spun at North Carolina-based Cone Denim Mills; plus I just love this Hazel Wash color. 5. Fisherman’s sweaters are great for keeping warm and cozy, but they’re usually large, boxy, and made of ultra-itchy wool. This tunic-style sweater from LLBean breaks the mold with a slimmer, longer fit and scratch-free cotton yarns. 6. Sadly, the rain likes to follow Nate and I to all of our favorite sporting events and there’s a pretty good chance you’ll have to endure some type of precipitation at Beaver Stadium this year. Be prepared beforehand so you don’t look like a drowned rat come rain day. I’ve searched high and low for a stylish, anorak-style jacket, and it’s been tough. Most styles this season focus more on fashion than function, made from a thin cotton or canvas and are hoodless. But what’s the point of donning the jacket if it can’t keep you warm and you’re head dry. I like this jacket from Athleta. Also, unlike most other jackets that hit mid-thigh, this jacket is hip length and won’t encroach on your stadium neighbors. 7. These beautiful drop earrings are from Ardmore, PA designer Marilyn Shiff. 8. How awesome is this Nittany Lion bracelet cuff!? Check it out in person at Aurum Jewelers on South Allen Street when you’re back in town, but if you’re like me, you can easily order it from their online store. 9. What’s a college football game without a favorite cap? If you decide to don the baseball hat, keep the rest of your outfit logo free. Or just bring one with you in case of the aforementioned rain or wind. This keystone “S” hat can be found at Lion’s Pride on College Avenue. 10. I’m loving all the blanket-style capes I’m seeing in stores this fall; they’re perfect for wrapping up in at the tailgate and a great layer to take into the stadium. This one from Nordstrom in a bright blue plaid will complement your navy and white layers. 11. Not into the long cape? A simple blue and white striped scarf will easily dress up jeans and a sweater. 12. This vintage buffalo check and plaid wool blanket is a classic from PA-based outdoor clothing company, Woolrich. Did you know the Woolrich Woolen Mills is located only 40 miles from State College? Woolrich is a proud sponsor of the Penn State Football Fan Festival that takes place every Saturday morning before a home football game outside of Beaver Stadium. 13.& 14. Besides small wristlets, purses and bags are not allowed in Beaver Stadium. This is fine – you can get by with some cash, lip gloss, and your phone for a few hours. But I can’t have an accessories round-up without including a cute bag, and this purse and bag tag combo from JCrew are so chic! For a truly personalized Penn State look, add a “PSU” monogram like I did on the bag tag above. 15. I could give you a ton of cute flat or boot options, but since a typical game day involves lots of walking and hanging out in muddy fields or rocky RV lots, in reality, you should stick with sneakers. Luckily, there are lots of cute sneakers out there. I like this low-profile one from Nike. 16. As we get into late October and November, game day temps will be chilly. Keep those toes warm and dry with a pair of the original “duck shoes” – LLBean Rubber Mocs. Yes, this post is geared toward the ladies, but I couldn’t help adding a few pieces for all the PSU guys out there. 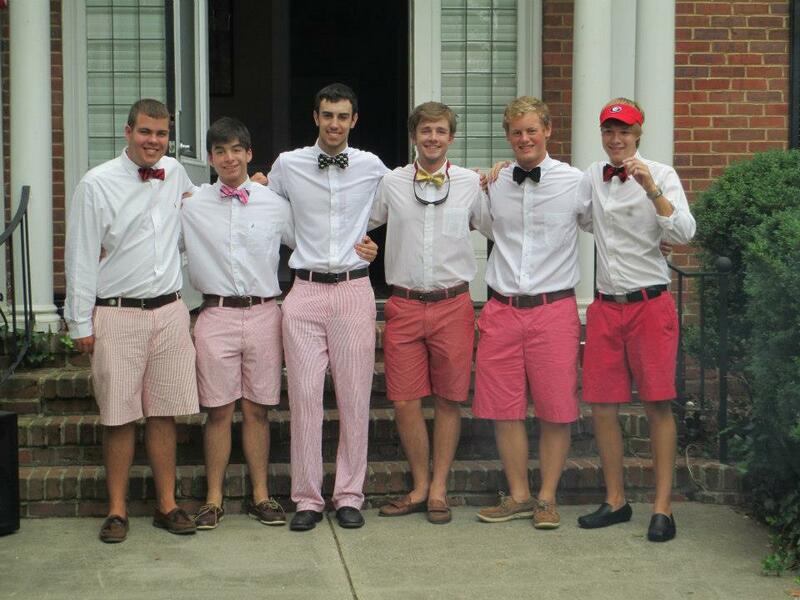 Men have it pretty easy when it comes to football stadium attire. I personally love the casual, laid-back look of jeans, tees, and sneakers – SO MUCH MORE than the southern, preppy look of khakis, button-down shirts, and bow ties. I mean, this just looks ridiculous and cannot be comfortable for tailgating and tossing around the pigskin all afternoon. Just like the ladies, stick to the classics, but invest in a great fitting pair of jeans and a unique accessory like the cool watch below. 17. Show off your college pride with these t-shirts from Lion’s Pride. They’re made from a cotton/rayon blend, making them extra soft – like you’ve owned it for years. Alumni, these tees are a must for homecoming weekend. We proudly represent the College of Communications and College of Engineering in North Carolina with these shirts! 20. Sick of spending $50 on a pair of jeans at the mall only to find holes and rips in them weeks later? Do yourself a favor and check out the line of high-quality, made in the USA denim from 1791 Supply and Co. The price tag may seem steep, but these babies are worth it – plus you’ll be supporting American jobs. We love that all 1791 jeans are woven at one of the oldest mills in the country, right up the road from us in Greensboro, NC. Nate got a pair when the line launched in 2012 and has been a selvage jean junkie ever since. 22. What guy doesn’t want another ball cap. This one from Nike has their Dri-Fit technology to help keep you cool during extra-tense game situations. 23. Ok, this probably isn’t in a college student’s budget, (Maybe an awesome Christmas present for making the dean’s list?) so alumni, if you don’t know about Shinola’s goods, you’re missing out. This Detroit-based watch and leather goods company refuses to give up on American manufacturing and have created some A+ goods in the process. All of their watches are cool, but The Runwell Sport Chronograph with navy rubber strap is perfect for an afternoon at Beaver Stadium. Hey PSU Coeds – Ditch the Mom Jeans and Converse Sneakers: A guide to chic football fashion this Homecoming weekend.